How can buildings be protected against termites? When building a new home or extending your current homes it is imperative that you prevent future termite attacks by treating the construction area during the building process. This is particularly important in the many council areas that have declared themselves as "termite prone". In order to obtain your certificate of occupancy you must produce documentation proving you have met the minimum requirements in having your home protected against termites. Published Standards outline the procedures that must be followed to protect new and existing buildings in Australia. 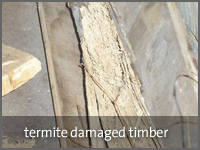 Since most termite-related damage to timber occurs from subterranean termites, preventative measures rely heavily on the establishment of barriers to stop the termites getting into the premises or timber from the underlying soil. Chemicals that are used to kill termites are called termiticides. Termiticides have differing modes of action, and several methods are used to apply them. The termiticide is applied to the soil under the slab and around the footings, pipes, conduits and other structures of the house during construction to create a vertical barrier. Further loosened soil around the perimeter of the house, including around all pipes and service facilities, is treated during and after construction to form a horizontal barrier. 1. Toxicity - the termites are killed by the insecticide in the soil. 2. Repellency - the termites actively avoid the area containing the insecticide. Bifenthrin is an APVMA registered chemical soil barrier Termiticide. It is environmentally safe when applied in accordance with the product label. The chemical soil barrier involves treating the soil at the base of a building. This deters termites traveling through the soil to get to the timbers of the structure above. Trenching, drilling and rod injection are performed to ensure the chemical barrier is positioned at the right depth, total building perimeter coverage is required. Nearly all home owners realise how important it is to look after their most valuable asset and to maintain their house in a good state of repair. Most home owners also do whatever they can to prevent their house being infested by termites or other timber pests and to have them eradicated should attack occur. It is therefore amazing that not all prospective buyers insist on a pre-Purchase inspection before investing their money in a pre-owned house. After all, would you buy a second hand car without having it checked out for mechanical faults and for rust in the bodywork - or without a Roadworthy Certificate. Our service fully meets the inspection requirements of the relevant Australian Standards and every inspection is performed by an accredited termite inspector. A verbal report is given to you on the day and a detailed typed report follows in the mail or on line. 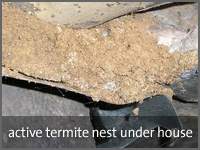 Network Pest Control specialise in Pre-Purchase Inspections. We have many satisfied customers who have used our services when deciding to purchase their new home, and found our report and advice to be very helpful in giving them all the information they need to make a well informed decision. Many people get their new home checked by a building inspector for the structural aspect of the house but they forget about the importance of checking for past or present termite damage which can result in $1000's that has not been budgeted for. At Network Pest Control our Timber Pest inspection process works to a comprehensive pre set reporting system designed to meet Australian Standards for Timber Pest Inspections. Our inspectors will note any evidence of past or current activity including termites, borers and fungal decay. Please note: This is a visual inspection only. In accord with the requirements of AS4349.3 our inspectors are limited to the areas and sections of the property which have reasonable access, which was both available and permitted on the date of inspection. They are not permitted to drill into walls and floors. They cannot lift and move furniture and we cannot go gouging into suspicious wood without the direct permission from the current owners. The inspectors carry out a room by room, area by area inspection marking all their finding for that area. In addition they will inspect the sub floor and roof cavities (if accessible), outbuildings such as garages, carports, pergolas and decking (up to 50m or the boundary line of your property).